Savannah Segway Tours located in Historic Downtown Savannah is all about being able to Segway around the best things to do in Savannah, Georgia. Our Historic Savannah Segway Tour has 22 story filled squares to offer and we cover as many as possible. The Savannah Segway Movie Tour gives you the opportunity to ride along the same paths your favorite stars walked on. Our Savannah Segway Tour of Bonaventure Cemetery will fascinate and intrigue everyone with her Victorian statues. 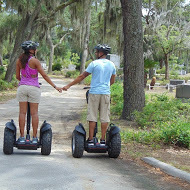 Savannah Segway Tours offers a North Beach of Tybee Island Tour and it has the perfect picture landmark! You get to smile in front of one of the few working lighthouses in America. Want to go to Bonaventure Cemetery or Tybee Island but don’t want to take your car? Don’t worry. We have a 12-passenger van that leaves from downtown and will take you to Bonaventure Cemetery or Tybee Island! You book a tour with us and we take care of everything,even the bottled water. We are family and pet-friendly. There are minimum age requirements for the Segway…call for details. Will you be bringing your dog? Great! Call for arrangements. Join us for a fun Segway tour of Savannah!